Waller then added two items to the agenda, and the Authority subsequently approved unanimously the spending of up to $375,115 on a contract to beautify Mars Hill Road and preliminarily approved up to $150 million in bond funding to Presbyterian Homes for construction of its Oconee Campus. The beautification of Mars Hill Road will include the planting of 660 treas of different species along the roadway, beginning at Daniells Bridge Road and running through to Butler’s Crossing. Some of those trees will be planted in the median. In addition, vines or even a mural will be used to cover the concrete slab at Hodges Mill Road. Traffic is now running freely along the just completely roadway. Some final sod installation is still ongoing, County Administrator Justin Kirrouac told me last week. To get state funding for construction of the roadway, the county had to turn it over to the state, which imposed state and federal standards. Oconee County Board of Commissioners Chair John Daniell told the IDA he expected the state to turn the road back to the county in the fall. Funding for the beautification project is coming from money the county borrowed through bond sales when it built Parkway Boulevard as part of the expansion of Epps Bridge Centre. Ken Beall and Associates was awarded the contract for the work Mars Hill beautification. Jerry Peterson, representing Presybyterian Homes, told the IDA he was asking for preliminary approval for the Authority to issue up to $150 million in revenue bonds for the Presbyterian Village Athens to be located on U.S. 441 at Hog Mountain Road. He said the bonds would be repaid through funds potential tenants pay as entrance fees, through a United State Department of Agricultural loan for heath centers, and bonds sold to institutional investors and banks. Jim Woodward, who serves as a consultant to the county on bond sales, said the package proposed by Presbyterian Homes would have no impact on the county, though the Board of Commissioners would have to hold a public hearing before approving. Alex Patterson from Presbyterian Homes said construction is scheduled for the fall. I was not able to attend the meeting of the Industrial Development Authority but Sarah Bell did attend and recorded the video below. Beall began his presentation at 2:35 in the video. Peterson began his presentation at 22:57. OCO: IDA 5 14 18 from Lee Becker on Vimeo. NOTE:This story has been updated on 8/15/2018 to change the amount of the bond sales from $115 million in the original post to $150 million. I was in the hospital at the time of the May 14 meeting and did not attend. Bell did attend and sent me the video and a note saying the request was for $150 million. From the video, it is clear that Peterson, bond counsel for Presbyterian Homes, used the figure of $150 million in the presentation on May 14, but, at one point, he seemed to say $115 million and also used the figure of $140 million. The actual document signed by Waller, which I received on 8/14/2018, shows the $150 million figure. I apologize for the error, which I should not have made. Please explain why the Oconee Develoment Authority would back bonds for Presbyterian Homes? Do they back other businesses when they enter the Oconee County market? If I understand correctly from earlier reports there is no connection with the Presbyterian Church? What happens if they fail, does the authority repossess the land and the facilities? Is it usual for a private company like Presbyterian Homes to ask a government agency to issue bonds for it? There is no impact on the county as long as they don't default. I wonder why they cannot obtain these funds through the other sources listed. I am glad a public hearing is needed. Perhaps such will answer my questions. It is important to know which entity is the guarantor for those bonds. Important to know just who is on the hook should the freight not get paid. Such things do happen. Frequently. 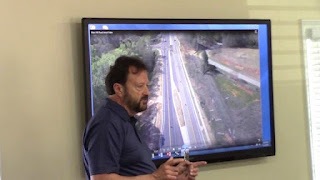 "the Authority subsequently approved unanimously the spending of up to $375,115 on a contract to beautify Mars Hill"
"Ken Beall and Associates was awarded the contract for the work Mars Hill beautification." Was there an RFP sent out for this almost $400k contract? How many bids were received? How was the RFP publicized? The IDA can just throw $400k around of taxpayer dollars with no accountability? Oconee County will get two new fast-food restaurants with drive-through windows on Georgia Highway 13/Hog Mountain Road near Oconee Primary School despite the objection of Oconee County Sheriff Scott Berry and a recommendation from the county’s planning board that the requests be denied. “Simply because the sheriff gave his opinion doesn’t make his opinion superior to anyone else’s,” Beall said. One of the primary advocates of the fast growth–and of the master plan developments that were a key part of it–was Ken Beall of Beall, Gonnsen and Co., a land planning firm. In October of 2003, the Board of Commissioners approved the rezone of 443 acres on U.S. 78 near the Apalachee River for Westland, which contained 430 residential lots in a master plan development. In December of 2004, just before Horton joined the Commission, that body approved the rezone of 500 acres between Hog Mountain Road and Mars Hill Road for another MPD. That development, called Parkside, included 810 residential lots. Beall, Gonnsen and Company represented both developers in the rezone requests before the Commission. Without much public support for my opposition to PH, I questioned Presbyterian Homes about the funding of this development with specific questions about bond issuance from Oconee County. They said that they would 100% self fund. Some of the PH bonds for other projects rated barely above investment grade (Speculative-Risky BBB+). I asked about this too and PH pretended not to understand bond ratings. I asked Oconee County Commissioners in emails about this same thing and got no reply. I actually met with one commissioner about this very thing. He was or played dumb. It's insulting enough that the taxpayers will fund this but they also will forever pay for it because PH will never have to pay taxes. In addition to the questions on the bonds, I asked about Oconee's Sewer capacity for the PH project before all of the sewer problems and personnel turnover. I asked this in a public forum. Again, no reply to emails and crickets during meetings. Following up on an article the Oconee Enterprise reported... the county eliminates the economic development position, and in this video, the county administrator says he looks forward to making a new economic development organization with the IDA and Chamber. Courtney Horton Bernardi is the daughter of sitting Commissioner Chuck Horton, and she was the previous economic development professional from John's Creek... The same place where County Administrator Justin Kerouac used to work. So within a span of 6 months, Courtney Horton Bernardi comes on board as Chamber president, and the county eliminates it's economic development position. It doesn't pass the Smell Test, that's for sure. Lee, I know you are fighting for your life right now, but I hope you will stay on top of this issue. Whatever this Kerouac, Waller, and Horton come up with, it deserves full scrutiny.